New Westminster Schools is committed to creating and maintaining a respectful, welcoming and nurturing environment. Incidents of bullying, harassment or intimidation and other types of serious misconduct are addressed in ways that restore or strengthen relationships. New Westminster Schools fosters positive school cultures and strives to ensure optimal environments for learning. erase empowers students, parents, educators and the community partners who support them to get help with challenges, report concerns to schools, and learn about complex issues facing students. erase features an expanded Get Help section on the new website – with links to 24/7 phone and text lines as well as online chats if a student, or someone they know, needs help. You can also watch videos, discover tools for schools to help promote erase in each school community, and more. The erase strategy was introduced in 2012 and has since been expanded to address complex issues concerning the evolution of social media, youth mental health concerns, world events impacting our schools, and other factors. It is important to recognize signs of bullying and to clearly identify the difference between conflict and bullying, in order to appropriately respond to bullying incidents. While the two seem similar in some instances, there is actually a distinct difference. Bullying is a persistent pattern of unwelcome or aggressive behaviour that often involves an imbalance of power, and/or the intention to harm or humiliate someone. Bullying often results in feelings of distress on the victim. Conflict is generally a disagreement or difference in opinion between peers who typically have equal power in their relationships. It’s usually an inevitable part of a group dynamic. Bullying isn’t just a child’s issue; it’s a school and community issue, and must be addressed with a school and community solution. The District strives to create a school and district culture which supports diversity, including a welcoming learning and working environment for everyone, regardless of sexual orientation, gender identity or expression. 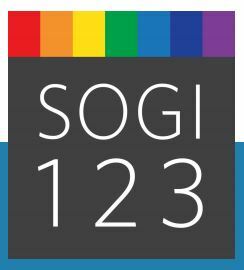 SOGI 123 has provided a welcoming resource explaining how BC’s Curriculum addresses inclusion and gender identity topics in schools. All resources are in alignment with the 2016 update to the BC Human Rights Code. These resources are available here and include this introductory brochure. 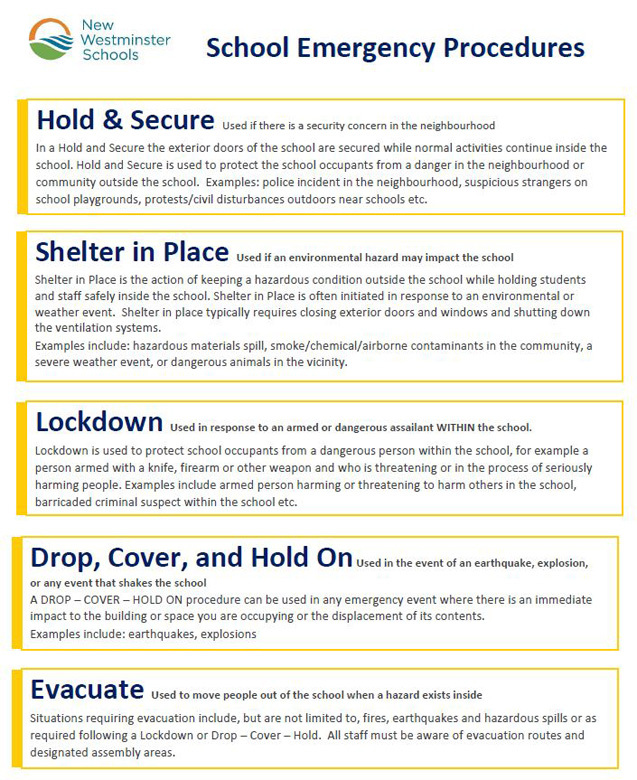 New Westminster Schools has emergency procedure protocols to help keep students, staff and volunteers safe during a real or perceived threat. In the event of an emergency procedure, schools can be placed under one of five ‘emergency actions’ or statuses to ensure the security and safety of students and employees. Information regarding each level of emergency status is listed in our Emergency Procedures Summary Sheet.SD40 Emergency Procedures Summary. Drills take place at schools regularly to ensure familiarity and compliance with emergency procedures. Notifications of emergency status will be posted via one or more of the below platforms; please connect with us online. The District recognizes that within an educational environment, students’ feelings of safety and belonging, including freedom from discrimination, can seriously affect their ability to learn. Schools are to be places where students, staff and parents are free from harm, where clear expectations of acceptable conduct are communicated and reinforced, and where socially responsible behaviours are taught, modeled and encouraged. Individual school codes of conduct can be found on each of the school websites under: About Us > Learner Success. A Violence Threat Risk Assessment is a process of determining if a threat maker actually poses a risk to the target(s) being threatened. The District Threat Assessment Protocol (see attached for information purposes) requires district staff trained in assessing threat-making behaviour to conduct an investigation to determine any risk involving a student who has made a threat; whether the potential risk is to others or to the student themselves. Fair Notice: Each school in our district has a Threat Assessment Team that includes the principal/vice-principal, counsellor, resource teacher, police liaison officer and district student services staff. In the most extreme cases, other Ministries may also be involved (e.g. Ministry of Children and Family Development and Fraser Health Authority). The purpose of the Threat Assessment Team is to promote the emotional and physical safety of all in the school and closely assess the threat-maker’s behaviour so that an intervention plan can be developed and implemented. In the interest of a safe and secure learning environment, threat assessments will be conducted whenever required, with or without the consent of the threat-maker and/or their parents. Constable G. Lau is the liaison for all middle and elementary school in New Westminster. 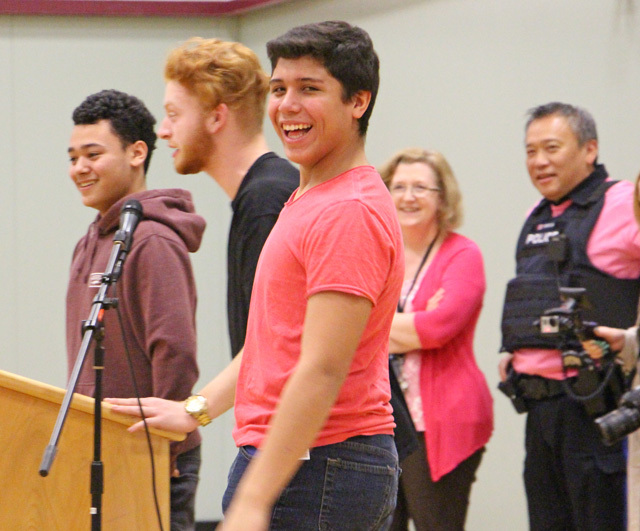 Constable Dave Zemlak is the liaison for New Westminster Secondary School. Constable T. Callaghan is the liaison for RCAP, POWER, and SIGMA. 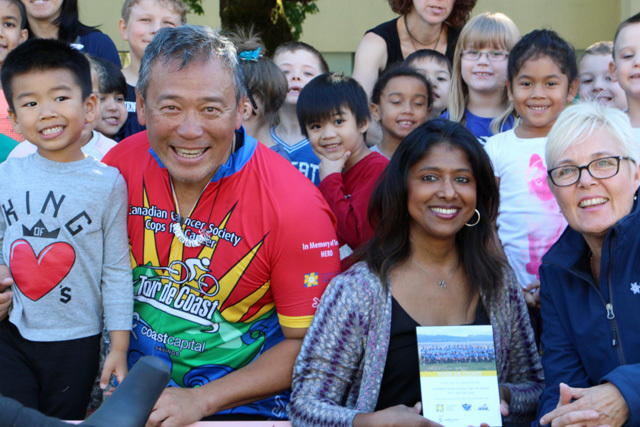 New Westminster Schools encourages students to walk or roll to and from school. We collaborate with New Westminster City, Translink, and HASTe BC to develop best routes to schools. Individual maps are located on school websites at Parents > Notices & Information > Best Routes to School. For cycling information, education and advocacy, check out the HUB: Your Cycling Connection.